Daniel Jonah Goldhagen in The Devil That Never Dies: The Rise And Threat Of Global Antisemitism (2013) posits that the term Jewness captures what anti-Semites conceive of as the essence and core noxiousness of Jews. It describes Jews’ primary quality, as anti-Semites perceive them, a quality that both resides within the Jew and is the source of his or her noxiousness or malevolence of aspiration and deed. It is this essential quality that ultimately needs to be dealt with, often by elimination, if the imputed dangers Jews pose or harms they are causing are to be resolved. The term Jewishness inadequately captures this quality because it either describes Jews’ self-identity or their cultural characteristic or attachments, both of which anti-Semites are less if at all concern with. For anti-Semites, the essence of individual Jews, and the essence of Jews the world over is their Jewness. Stephen Kinzer in Reset: Iran, Turkey, And American’s Future (2010) writes that after May 14, 1948 the United States began treating Israel like any other developing country. It was made eligible for aid under the “Point Four” program, which would bring it $3 million to $4 Million annually. Israel wanted much more, and Abba Eban, it ambassador in Washington, set out to obtain it. In early 1950s Eban helped forge a lobby group called the American Zionist Council, later renamed the American Israel Public Affairs Committee, or AIPAC. It won a quick series of victories, persuading Congress to approve $65 million in aid for Israel and another $70 million in low-interest loans, none of it requested by the White House. Central American armies were not the only ones that turned to Israel for help. Dictators around the world, from Bolivia, Chile, and the Dominican Republic to Burma, the Philippines, and Indonesia, equipped their soldiers with Galil assault rifles and Uzi submachine guns. Israel also became the principal arms supplier for the apartheid regime in South Africa, which President Reagan fervently supported but could not arm because of congressional restrictions. 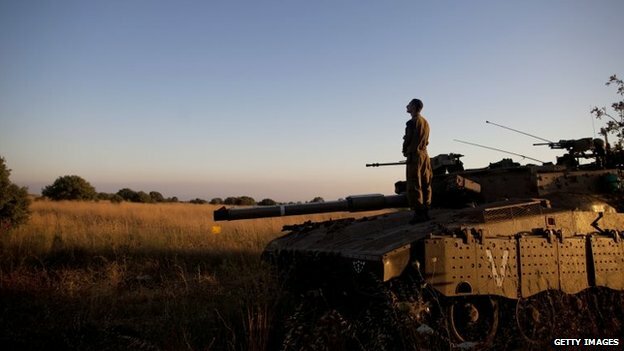 Israelis trained South Africa’s elite police and military units, sold tanks and aviation technology to its army, licensed the production of Galil rifles at a factory in South Africa, and even advised the regime on developing nuclear weapons. In 1976 Prime Minister John Vorster of South Africa, whom the British had jailed during World War II for his pro-Nazi activities, was given a red-carpet welcome in Israel, laid a wealth at the Yad Vashem Holocaust memorial, and heard Prime Minister Yitzhak Rabin praise him at a state banquet for creating a “prosperous atmosphere of cooperation” between their two countries. Israelis trained more than a dozen guerrilla and paramilitary forces blessed by Washington. They established private security forces in Colombia that ranchers and drug traffickers used to protect themselves and dispatch their enemies, and did the same in the Philippines during the Ferdinand Marcos dictatorship. In 1986 Israeli and American advisers worked together to shape two thousand Libyan exiles into a guerrilla force to fight Muammar Kaddafi’s regime. After Congress banned U.S. aid to anti-Marxist rebels in Angola, Israel sent them trainers, paid for indirectly by the Reagan administration. All of these unsavory countries had powerful friends in Washington, but those friends could not embrace them publicly. Israel had no such reservations. Whatever country the United States wanted to help but could not, Israel could and did. Goldhagen declares that a relevant American context highlights how different the United States is from Europe, where the rampant anti-Semitism appears that much more stunning given how insignificant in number and influence Jews are in European countries and the continent as a whole. When we consider how much more prominent American Jews are—by any and every measure of prominence—anti-Semitism’s comparatively low levels in the United States takes on even considerably more significance, as do anti-Semitism’s comparatively high levels in Europe. American Jews are highly visible, being in fact the dominant ethnic group in the greatest metropolis, the financial and economic center, and in many ways the cultural center of the United States, New York City. They are prominent in business and finance, politics, culture, and the media. They are well represented in the highest reaches of power, the House of Representatives, the Senate, the Supreme Court, and as prominent members of successive American administrations. They actively and self-confidently, as individuals and as a community, promote their interests and their understanding of the United States’ interests, including support of the besieged, sole genuinely democratic country in the Middle East: Israel. Goldhagen in his haste to declare that all Americans love Jews has forgotten why Barack Obama had to be helped into office. It was to prevent the very action that he imagines that global anti-Semitism can create. Obama’s election in 2008 was engineered to hold off the American Holocaust. The shock of his election as the first Black President caught the entire world off guard and stunned the populace throwing the entire nation into a state of mass hypnotism, even the Nobel Committee. This may seem farcical to some political observers, notice what was a possibility with the National Rifle Association tell the economic losers that arming themselves is the only answer. Thing are so desperate in the US until it is legally common to walk into an elementary school with an automatic weapon; kill Middle Class White children and only make the news media for one or two days. Goldhagan’s self-confident praise song to love of Jewish Community had another test with the vanquishing of Eric Cantor from his House seat as Majority Whip, for the first time in the history of the United States, after he redrew the lines of his Virginia District to include a rural community; thus intimating that the same people who hate Obama; hate him too. … sees Hamas as a terrorist group. President Abbas has condemned the apparent kidnapping of the three Israelis as well as Israel's military response. A spokesman for Israel's PM says they are putting "maximum effort" into finding three missing teenagers. It is just over a week since 16-year-old Naftali Fraenkel and two other young Israelis Gilad Shaer, also 16, and Eyal Yifrach, 19, disappeared from a busy hitch-hiking junction on Route 60 in the occupied West Bank. The students were trying to get home from Jewish seminaries in settlements in and near Hebron. "They are three innocent kids. All they were doing is coming home from school and we haven't seen them since. 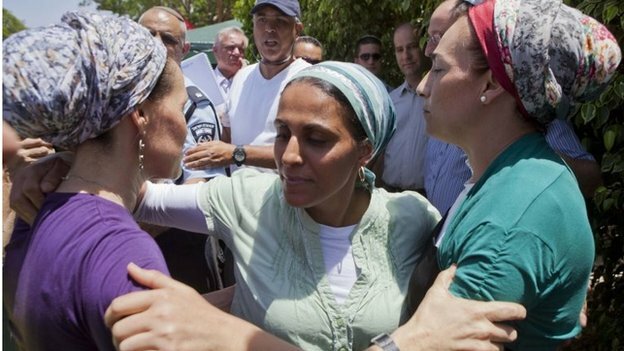 We miss them," Ittael Fraenkel, Naftali's aunt, told the BBC. "I don't know what he [Naftali] is going through. That's the hardest part but I know he's strong. We really hope for mercy." Israel has launched a huge military operation called Brothers' Keeper to try to find the missing teenagers. More than 300 Palestinians have been arrested. Most belong to the Islamist movement Hamas. Israel accuses Hamas of taking the missing teenagers - but no Palestinian militant group has said it was responsible. In Israel, a social media campaign has been launched with the hashtag, #BringBackOurBoys. Many Israelis are deeply worried, particularly those who live and work near the West Bank settlements. Settlements are considered illegal under international law, though Israel disputes this. "It's a terrible thing that happened to those boys and their families," says Chana Rue, who often hitchhikes along Route 60 between Hebron and Jerusalem because of the patchy public transport. "Those boys have no idea what's going to happen to them and we're not even 100% sure that they're still alive." "All the people I know, we're really concerned - we're always on our iPhones looking for some good news," adds another young woman, Noa Laron. "This is what we speak about all day and we really pray a lot and that our soldiers will be safe and sound because they're not in a good place right now." 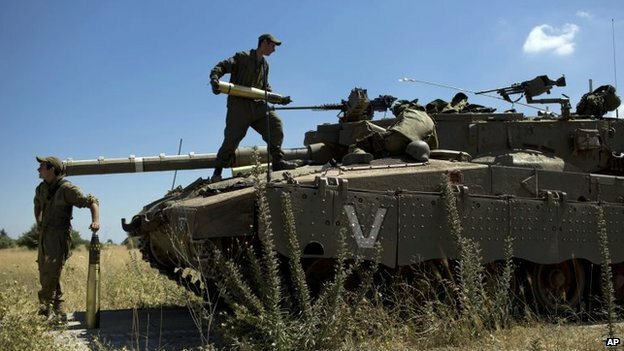 Thousands of Israeli troops are involved in the search operation. 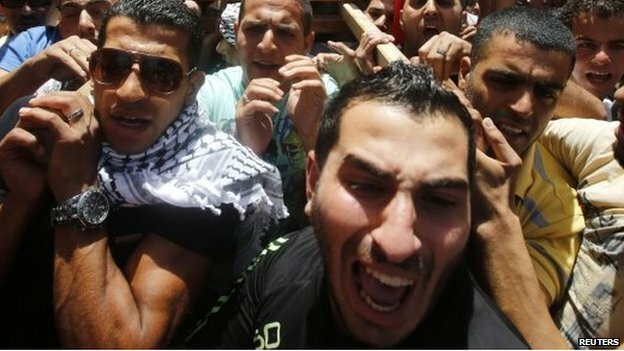 There have been violent clashes as they have entered Palestinian towns and villages. Two young Palestinians have been killed, causing anger and resentment to rise. On Friday, a 15-year-old Palestinian boy was shot dead in Dura, south of Hebron, when Israeli soldiers opened fire. Earlier this week a young Palestinian man was killed in the Jalazoun refugee camp, near Ramallah. The southern city of Hebron has been virtually closed by the Israeli military. Most Hebronites are prevented from travelling freely around the West Bank and going abroad. "More checkpoints, more closures. I've not been to my job all week," says Issa Amro. "You are waiting for the soldiers to come to your house any time. You are completely terrified about your children, your family, your neighbours. "This is a kind of revenge against the Palestinian civilians for what happened to the Israelis and we're not responsible for it." "I'm so worried about the situation escalating," says Zleikha Muhtaseb, a resident of the Old City of Hebron. "Detaining people in big numbers like this is meant to send a message and create more tension in society." "Now many Palestinians are angry with the Palestinian Authority [which governs parts of the West Bank] as they feel it's not protecting them," she says. "Of course there's probably nothing they can do. We know Israel doesn't want to see Palestinians united." 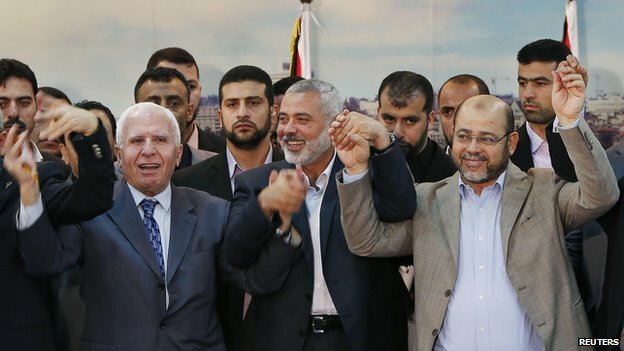 The latest developments come just after the two main Palestinian political factions - Hamas and Fatah - set up a new unity government, made up of technocrats, to pave the way for elections. It is led by President Mahmoud Abbas, who heads Fatah. Israel strongly opposed the creation of the new government and broke off peace talks with Mr Abbas in April after the reconciliation deal. Along with the European Union, the United States and other countries, it sees Hamas as a terrorist group. President Abbas has condemned the apparent kidnapping of the three Israelis as well as Israel's military response. His troops have been helping with the search, drawing criticism from Hamas officials. Israel has made clear that its military objectives in the West Bank include targeting Hamas operatives and infrastructure. Hamas has been responsible for previous abductions of Israelis, including the soldier Gilad Shalit who was held for five years in the Gaza Strip. Outside the Fraenkel family house in the Orthodox neighbourhood of Nof Ayalon, near Modin in central Israel, friends and neighbours are saying prayers. 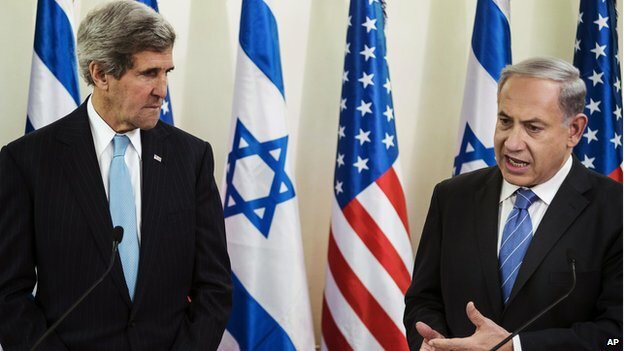 Have MidEast talks failure killed two-state goal? Twenty years ago, when the Palestinian-Israeli negotiations were fresh and young, millions from both sides thought a peace agreement, at long last, was going to make their lives much better. It didn't happen. Twenty years of off-on talks, punctuated by violence, have not worked. In many ways, Israelis and Palestinians are further apart than they were when the peace process started. For two decades now the world's favourite peace plan has been the 'two state solution'. It assumes that the conflict is about territory. Two sides went to war over a single piece of land, and the idea is that if they can agree to split it they have a chance of living in peace as neighbours. But negotiators, helped by a variety of foreigners, have been trying for twenty years, and they have not made a deal. Israelis and Palestinians have heard the arguments so often, and seen so many failures, that they have stopped listening. One man summed it up. "While I think that we want peace, the other side wants peace, it just sounds like a broken record that's been scratched and is going around and around." It so happened that he was an Israeli, wearing the knitted skull cap of the religious Zionists who are the backbone of the settler movement. But the same thing could have been said by almost anyone on either side. 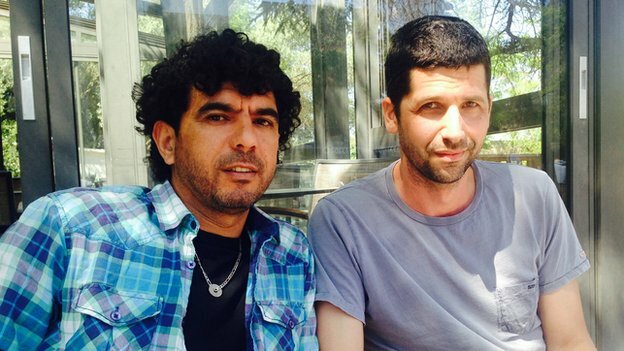 On a sunny Jerusalem morning I met two 30-something men, a Palestinian called Sulaiman Khatib and an Israeli called Avner Wishnitzer. They are peace activists, a species common in the 1990s at the height of the peace process, but hard to spot these days. They are part of Combatants for Peace, a group that brings together former fighters. Avner was in Sayeret Matkal, Israel's elite special forces unit. Sulaiman was sentenced to 15 years in an Israeli jail when he was 15 years old for attacking Israeli soldiers. "If the solution is two states," Sulaiman said, "you need to give up part of your dreams and that's the truth. You have to meet in the middle somewhere, no side will get everything they want". Avner said he tried to appeal to mainstream Israelis. He said their fears were real. "The dangers are real. We have to convince people, Israelis, that Palestinians - most of them, not all of them - but most of them do not want to throw us into the sea." It was good to see two men who once could have killed each other sitting down as friends. But I could have done the same interview 20 years ago. In the 1990s some Israelis and Palestinians had come to the same conclusions. But today most Israelis and Palestinians still do not trust the other side. Before the start of the talks that were meant to have ended, presumably in success, on Monday of this week, the US Secretary of State John Kerry warned Israelis that they might not get another opportunity. In a news conference in Tel Aviv on 24 May last year, he said: "We are running out of time. We're running out of possibilities...If we do not succeed now, we may not get another chance." Mr Kerry worked very hard, and so did all the negotiators. The secretary of state had 34 meetings with Palestinian President Mahmoud Abbas and almost twice as many with Israel's Prime Minister Benjamin Netanyahu according to the New York Times. The peace process has brought ideas that were once highly controversial into the mainstream, like the idea of a Palestinian state that Israel and the Americans once rejected. But the negotiators have not been able to take the final steps. Both sides say they want peace, and there is no reason to doubt them. But they can't agree what peace looks like, what would happen in Jerusalem, where the borders would be, the future of Israeli settlers and Palestinian refugees, and so on. A final deal would need both leaders to persuade their people that big sacrifices are necessary, and will in time improve their lives. It hasn't happened, and they have had plenty of opportunities. Perhaps the time has come to recognise that there is not going to be a two-state solution. It is logical, and has been worked out innumerable times on paper. But the two sides cannot bear to abandon cherished beliefs and ideas. Making it happen has been impossible, but other visions of the future do not come any easier. Mr Netanyahu seems to believe that Israel can manage the conflict, and preserve his government. Settlement building in the occupied territories continues, which protects him on the right. President Abbas, exploiting the enhanced position of the Palestinians at the UN, has signed up to a number of international organisations and is likely to join more. Secretary of State John Kerry has been forced to apologise, in effect, for remarks he made saying that Israel risked becoming an apartheid state if it cannot make a deal with the Palestinians. The argument is that if Palestinians do not have their own state, they will have to be inside Israel. If they were given the vote, their birth rate means they would soon be able to outvote Jews. If they were not given the vote, Israel would be like the old South Africa. Many Palestinians believe that their best strategy is to persuade the rest of the world that Israel should be isolated. They want it to be compared to apartheid South Africa. The chances are there will be more peace talks. They have been declared dead many times and have always, just about, come back to life. Israel has named two men as suspects in the disappearance of three Israeli teenagers believed abducted in the West Bank earlier this month. 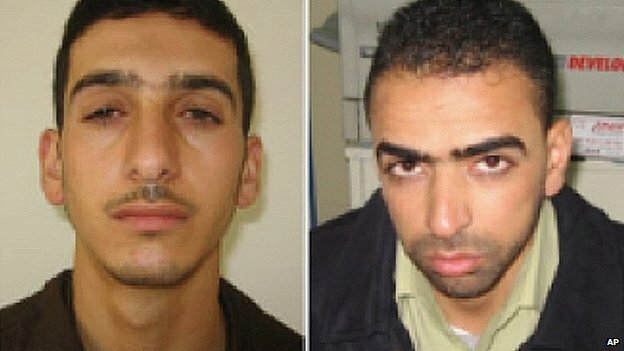 The Shin Bet security service said Marwan Qawasmeh and Amer Abu Aisha were associated with the Palestinian militant group Hamas. Israel has repeatedly accused Hamas of kidnapping the teenagers, a claim it strongly denies. Hundreds of Palestinians have been arrested in the hunt for the youths. Five people have also died in clashes as Israeli soldiers carried out intensive house-to-house searches in the West Bank. On Thursday, Israeli and Palestinian officials said the two men had been missing since the teenagers disappeared, and that a manhunt was under way. Shin Bet said both men had served time in Israeli prisons for "terrorist activity" and were from the Hebron area, where the boys disappeared from earlier this month. Amer Abu Aisha's father told the Agence France-Presse news agency that his son was not involved in the disappearance of the youths. But he added that he had not seen his son since the day after the teenagers went missing. The three teenagers disappeared while hitchhiking home Naftali Frenkel and Gilad Shaar, both aged 16, and 19-year-old Eyal Yifrach went missing at a junction near Hebron as they hitchhiked home. Naftali Frenkel holds US-Israeli citizenship. The leader of Hamas, Khaled Meshaal, reiterated on Thursday that "we do not have information about what happened". The teenagers' disappearance has triggered one of the most intensive Israeli search operations in the West Bank for years. Israeli Prime Minister Benjamin Netanyahu has said the incident is a consequence "of the partnership with Hamas", with whom Palestinian President Mahmoud Abbas signed a unity deal in April after years of division. On Thursday he said he now expected Mr Abbas to "break his pact" with Hamas. Daniel Jonah Goldhagen Goldhagen in his haste to declare that all Americans love Jews has forgotten why Barack Obama had to be helped into office. It was to prevent the very action that he imagines that global anti-Semitism can create. Obama’s election in 2008 was engineered to hold off the American Holocaust. The shock of his election as the first Black President caught the entire world off guard and stunned the populace throwing the entire nation into a state of mass hypnotism, even the Nobel Committee. spiritual wickedness in high places..
that said, it IS farcical. but tragedy inextricably linked with comedy and uh...well satyr plays...whatever they are..